In Content Station, users can show or hide the columns that appear in a Document pane. Figure: The Document pane (A) in a Dossier. When viewed in List view mode (shown by default), various columns are shown, each representing a property of a file such as name, Workflow Status, modified date. Showing or hiding columns is done by selecting or de-selecting options from a list. 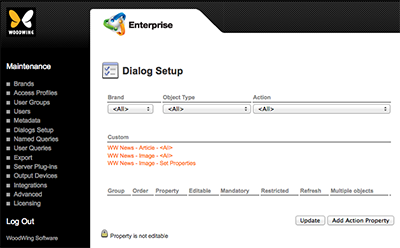 The options that appear in this list can be controlled through the Dialog Setup Maintenance page of Enterprise Server. Step 2. From the Action list, choose Query Result Columns for Content Station. Step 4. (Optional) In the Order box, enter a number that specifies the order in which the property should appear in the list. Step 5. From the Property list, choose a property that should be available in the list. Note:Custom properties are listed first and are preceded by an asterisk character (*).